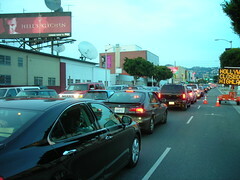 Every year the city of Los Angeles begs people not to drive into Hollywood to see the annual Christmas Parade. Here's why. This light changed three times and these cars didn't move (but they did all honk their horns incessantly). On the work front, today I went by the lot to pick up my final check from the Christmas job. There's quite a lot of stuff shooting, but none of the people I usually work with are doing anything. The perils of freelance, I guess. Monday I've got to get on the phone and try to scare up some work for December. No work, but plenty of excitement. Sometime in the past few days, I hurt my thumb. The joint's swollen and I can't bend it. I have absolutely no idea how it happened (although I'm tempted to blame Cam-Lok connectors) but since I do tend to use my thumbs quite a bit, I figured I'd get it checked out. When I showed it to the doctor, he said, "You fucked something up. Take some Motrin and soak it in warm water. Maybe that'll clear it up." All that medical school for a diagnosis of "fucked up"? That, I'd already figured out. "Tell me something I don't know," I said. He thought for a moment. "Buy low, sell high?" I like my doctor, but sometimes I really want to kick him. Plus, I already knew that. So, I've got a bottle of Motrin and official medical advice not to use my thumb for the next three days. Wish me luck with that one. In more exciting news, yesterday, LA county mental health services hauled my landlady off to the nuthatch. She's always been, um, eccentric.. but it's gotten worse in the past few weeks. It all started when her kids tried to get a power of attorney (which is a reasonable request when one's parent is 80, I think), and she freaked out. She interpreted it as an attempt at a pre-death asset grab and stopped eating or sleeping - she just cried all day and all night. The lack of sleep turned into paranoia, and since my landlady lives next door, her pounding on my door at 1 am to tell me that the streetlight was watching her and that I should take my stove apart to make sure there weren't any electronic bugs in it. "Check your oven, too! They might be listening to everything you say!" Honestly, I didn't realize how bad it had gotten. I'd heard pounding noises at night, but hadn't really worried about them. She's always been handy, so I figured she was boarding up the windows or installing shelves or something (sometimes I'll do stuff like that when I can't sleep). I'd offered to take her to the grocery store if she needed it, but she said she was fine. Turns out, she's ripped out all the electrical wiring in her house (because it was listening to her, I guess) and there's a gas leak because in her zeal to find the 'bugs' - she knocked big holes in the walls and hit the gas line with a hammer. The social workers who took her away yesterday were very nice, and implied that she'll be okay soon, once she's gotten some medical treatment. I hope so. I haven't heard anything about how she's doing, but it's been less than 24 hours, so there may be no news yet.